For the first time since 2003, collectors can look forward to MLB-licensed Mark McGwire autographed baseball cards in 2014. Topps announced they have signed the retired slugger to an autograph deal. 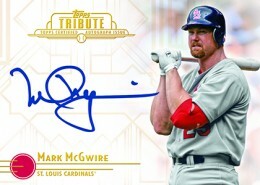 Signed Mark McGwire cards are slated to appear in several 2014 Topps products. The first autographs under the deal will appear in 2014 Topps Series 1 Baseball, which is scheduled to come out in January. Plans include signatures in many other sets including 2014 Topps Tribute, 2014 Topps Archives, 2014 Topps Museum Collection, 2014 Topps Allen & Ginter and more. This marks the first time Mark McGwire has signed cards for Topps. At one time, Mark McGwire had one of the most popular autographs in all of baseball. At the height of his popularity, he didn't sign much. Even with a deal with Upper Deck, Mark McGwire autographs were rare when it came to certified cards. While he has a lot of different signed cards now, most have very limited print runs. McGwire has signed most recently for 2013 Panini USA Baseball Champions and 2013 Upper Deck Goodwin Champions. 1991 College Classics USC Trojans Mark McGwire Card SGC 8.5 NM-MT+ Rare!